Secretary of State John Kerry said Sunday that the United States will increase the number of refugees it accepts annually from around the world to 85,000 in 2016 and 100,000 in 2017. "This step is in keeping with America’s best tradition as a land of second chances and a beacon of hope," Kerry said following a meeting with German Foreign Minister Frank-Walter Steinmeier about the Syrian refugee crisis, the Associated Press reported. The number would mark a more than 40 percent increase in accepted refugees over two years. Currently, the U.S. caps the number of refugees at 70,000. Earlier this month, President Obama ordered the government to accept at least 10,000 more Syrian refugees in the next fiscal year as approximately 4.1 million refugees flee the country’s civil war. Many of the refugees arriving over the next few years will come from Syria, according to officials, but some will also hail from areas of Africa. Kerry said Sunday that the U.S. cannot accept more refugees than its cap because of security screening requirements, emphasizing that the government will not cut corners when it comes to security checks. Nevertheless, government officials are worried that Islamic State (IS, also known as ISIL or ISIS) terrorists might see the Syrian refugee crisis as a channel through which to enter Europe or the United States. For example, director of National Intelligence James Clapper recently expressed "huge concern" that IS militants might infiltrate the crowds of Syrian refugees fleeing West. In the wake of Kerry’s announcement Sunday, chairs of the congressional judiciary committees said that Americans cannot trust the Obama administration to prevent terrorists from infiltrating groups of refugees in order to gain access to the country. "ISIS and other terrorist groups have made it abundantly clear that they will use the refugee crisis to try to enter the United States," Sen. Chuck Grassley (R., Iowa) and Rep. Bob Goodlatte (R., Va.) said in a joint statement. "Now, the Obama administration wants to bring in an additional ten thousand Syrians without a concrete and foolproof plan to ensure that terrorists won't be able to enter the country. The administration has essentially given the American people a ‘trust me.’ That isn’t good enough." The Obama administration does not need to obtain approval from Congress for the increased number of accepted migrants. 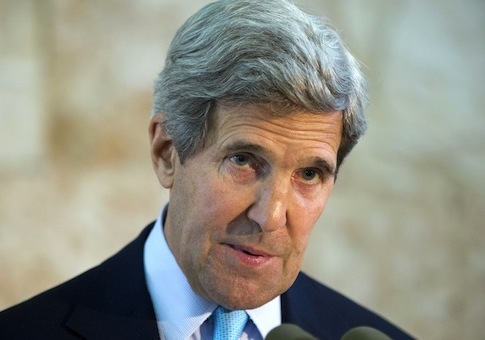 However, Congress would need to appropriate additional funds to support the effort, Kerry noted Sunday. This entry was posted in National Security and tagged Bashar al-Assad, Bob Goodlatte, Chuck Grassley, John Kerry, Syria, Terrorism. Bookmark the permalink.